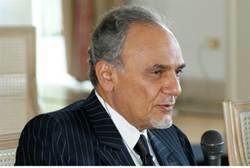 Saudi Prince Turki al-Faisal warned an attack on Iran’s nuclear program would only strengthen Tehran’s resolve. Turki al-Faisal said Monday a military attack on Iran aimed at halting its nuclear program could have catastrophic consequences – and would only strengthen Tehran’s determination to continue nuclear progress. “Such an act I think would be foolish and to undertake it I think would be tragic,” the Saudi prince said. “If anything it will only make the Iranians more determined to continue nuclear progress. It will rally support for the government among the population, and it will not end the program. It will merely delay it if anything,” he said. On November 4, Israeli President Shimon Peres said that an attack on Iran was becoming increasingly more likely. In reply senior Iranian officials described the threats as “foolish” remarks, and warned that friends and allies of the Islamic Revolution would destroy Israel before it can make the slightest military move against Iran. Defense Minister Ehud Barak has said, however, that Israelis – and Iranians – overestimate the damage Tehran can inflict on the Jewish state and should not be dissuaded from action by threats from the Islamic Republic. Turki – a former director of Riyahd’s intelligence services and diplomat – is expected to become Saudi Arabia’s next foreign minister. A reputed Saudi hawk, Turki has been a strong opponent of Iranian moves to gain hegemony in the Persian Gulf and Middle East – and has warned, should Tehran obtain nuclear weapons, Riyahd will follow suit. It is unclear, in the absence of military action, how Turki expects Iran’s nuclear ambitions to be curtailed. Meanwhile, reports have emerged the US is considering arming Qatar with huge bunker buster bombs, raising the possibility of an American-Israel-Arab attack on Iran.